There are few properties to rival this Sunshine Coast luxury accommodation. 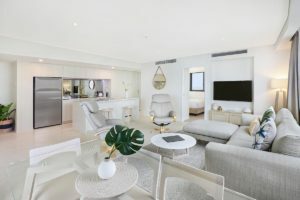 The Breeze is one of Mooloolaba’s newest apartment resorts and boy is it a beauty. This landmark on Meta Street and Mooloolaba Esplanade is an instant classic. If it wasn’t fashioned from concrete, steel and glass, you’d swear some hipster tried their hand at a handmade tower with its individually shaped balconies. Each floor plan is different. Designed to permit maximum sunshine and light within its stunning interiors. It’s nothing short of a masterpiece of design, and you’re invited to come and experience a holiday of unparalleled luxury. The genius is in the curves. 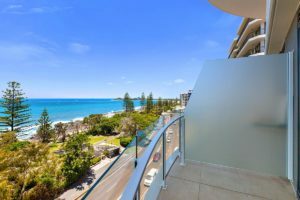 The Breeze Mooloolaba resort really is a space you’ll want to spend time in, reconnecting with family and relaxing. The balcony spaces provide the perfect extension for outdoor living and entertaining. Why not invite some friends to enjoy the largess of your holiday digs. Entertaining is a breeze in luxury accommodation like this. 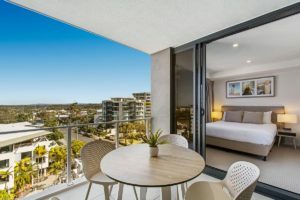 Our one, two and three bedroom apartments are ideal for the romantic getaway, or the Sunshine Coast family holiday destination. There’s tons of space to enjoy, and you’ll feel enveloped by the crisp modern interiors and the generous and comfortable furnishings. The designer chefs kitchen is great too, just the place to prepare all the fresh produce and bounty from the ocean. Make sure you get the catch of the day in Mooloolaba Spit. This is where you’ll find the seafood markets for the catch straight off the boats (almost). Whether you’re after those world famous Mooloolaba Prawns or local fish, you’ll find it here. Also along the way is Underwater World Sea Life with its exciting collection of live sharks, fish and stingray. Plan a trip for the day and enjoy the shows and live encounters. Further afield is the Eumundi Markets. Not only will you be able to bring back the bounty of the freshest produce for your table, there’s also a considerable number of other stalls to catch your attention with jewelry, crafts, fashion, small goods not to mention cafe stalls and street food vendors. You won’t have to go far at all when you book your holiday at this Sunshine Coast luxury accommodation. We recommend you book at your earliest convenience. We’re filling fast.